Companies eager to conserve cash are trimming their contributions to their workers' 401(k) retirement plans, putting a new strain on America's tattered safety net at the very moment when many workers are watching their accounts plummet along with the stock market. 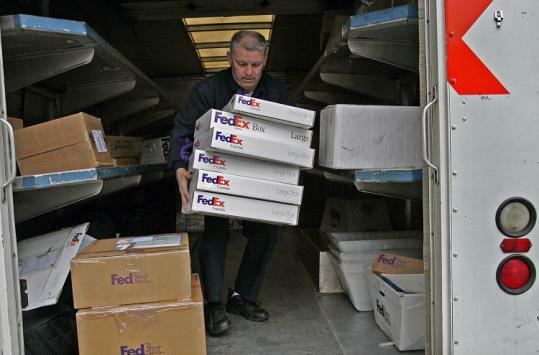 When the FedEx Corp. slimmed down its pension plan last year, it softened the blow by offering workers enriched 401(k) contributions to make up for the pension benefits some would lose. But last week, with Americans sending fewer parcels and FedEx's revenue growth at a standstill, the company said it would suspend all of its contributions for at least a year. "We will have to work more years and retire with less money," said Lee Higham, a 44-year-old senior aircraft mechanic at FedEx who has worked there for 20 years. "That's what we are up against now." FedEx is not the only one. Eastman Kodak, Motorola, General Motors, and Resorts International are among the companies that have cut matching contributions to their plans since September, when the credit markets froze and companies began looking urgently for cash. More companies are expected to suspend their matching contributions next year, according to Watson Wyatt, a benefits consulting firm. For workers, the loss of a matching contribution heightens the pain of seeing a retirement account balance shrivel away because of the plunging stock markets. "We are taking a beating," said another FedEx mechanic, Rafael Garcia. "In a year, I lost $60,000 of my 401(k). You can't make that up." To many retirement policy specialists, the lost contributions are one more sign of America's failure as a society to face up to the graying of the population and the profound economic forces it will unleash. "We have had a 30-year experiment with requiring workers to be more responsible for saving and investing for their retirement," said Teresa Ghilarducci, a professor of economics at the New School in New York. "It has been a grand experiment, and it has failed." In the typical 401(k) plan, the employer's matching contribution is more than just money for retirement. It also motivates employees to set aside more of their own money for old age. The more workers save in a 401(k) plan, generally, the more "free money" they can get from their employers under the matching provisions. Retirement policy specialists said they did not expect employees to react immediately to the loss of this incentive by stopping their own 401(k) contributions. Study after study has shown that employees tend to procrastinate when it comes to retirement-plan chores, and in this case the inertia may work, unwittingly, in their favor. Americans, however, are facing extreme household financial pressure. Given the extraordinary times, President-elect Barack Obama has said that he would support allowing withdrawals from retirement plans without penalties, which would provide short-term relief but would further undercut American's long-term saving power. "The problem is, we are heading into this serious recession, and we don't know how long it will go on for," said Alicia Munnell, director of the Center for Retirement Research at Boston College. "The bottom line is, people will have less money in their 401(k) plans, not just because the financial crisis has decimated their assets, but also because they will not have the employer match for some time." Many of the latest 401(k) cutbacks are turning up in industries with obvious financial problems, like the auto industry, healthcare, and newspaper publishing. Industries that depend on free-spending consumers, like resorts and casinos, are also seeing cuts. Often when one company in an industry cuts its benefits others will follow, to keep their labor costs competitive. General Motors and Ford Motor have both suspended their matching contributions to their salaried employees' 401(k) accounts, although their pension plans for unionized workers are unchanged. Motorola, struggling to stay competitive in the wireless communication business, stopped contributions to its 401(k) plan this month and froze its pension plan as well. In addition to stopping their matching contributions, companies have also been freezing salaries this fall, shifting more of the cost of healthcare to their workers, and laying people off. "These are really hard times and people are losing their jobs, and in some ways, a suspension of a 401(k) match, while bad, is probably one of the lesser evils out there," Munnell said. In announcing the suspension of the contributions last week, FedEx made clear that its workers in the sorting centers would not be the only ones feeling the pinch. Pay to senior executives is to be cut by 7.5 to 10 percent, and chief executive Frederick W. Smith said he would take a 20 percent pay cut.